Minnie Van Every Benold (1884-1969), the sister of my grandmother Myrtle Van Every Deutsch, at some point in her later years, the exact date is uncertain, wrote a few pages about her experiences as a child. Then too, after Indian Territory was opened for settlement (about 1888?) my father filed on a claim on Sac and Fox Reservation, possessed it and built a log house, a good barn, and sent for his family – all on the fact that mother was part Indian – in December 1891. After a snowy winter, he planted a crop, and made many trips to the County seat (Chandler) consulting his lawyer as his right to the land was being contested. In a fit of discouragement he loaded us all in a wagon and started back to Texas. He said he could not find an honest lawyer. We left in Spring 1892, after we could not get a hearing on our claim. I do know, or at least have been told that no records were kept during those years. So it was last night I put the name Samuel Denyer into Footnote. The brother of my second great grandfather, Ebenezer Denyer. I was looking for his Civil War record. Instead I found a reference in the Dawes Packets. The Amercan Dawes Commission, named for its first chairman Henry L. Dawes, was authorized under a rider to an Indian Office appropriation bill, March 3, 1893. Its purpose was to convince the Five Civilized Tribes [Cherokee, Choctaw, Creek, Chickasaw, Seminole] to agree to cede tribal title of Indian lands under an allotment process to the individual Indian, enacted in 1887 (See Dawes Act for other tribes). In November 1893, President Grover Cleveland appointed Dawes as chairman, and Meridith H. Kidd and Archibald S. McKennon as members. Footnote has almost all of the Application Packets (98% complete). This was exciting. It wasn't for Ebenezer's brother, Samuel, it was for Ebenezer's son, Samuel, the uncle of my grandmother. Ebenezer married Sarah Hartley who family lore says claimed to be 1/8 Choctaw. And in the Dawes packets at Footnote I have found the applications for admission to the Choctaw Tribe made by all of Sarah Hartley's children, from both of her husbands, Ebenezer Denyer and George Foster. As well as those made by her brother, Samuel Hartley. Apparently several years after they tried unsuccessfully to claim land, they tried again when the Dawes Commission was formed. The applications are dated November of 1900. I don't care. OK, I do care. If they had been accepted my grandmother would likely have grown up somewhere other than Texas, with possible repercussions on her adult life. I might not exist. Refusal, naturally, doesn't mean they weren't Choctaw, just that the commission wasn't satisified with the proof. But each application has between 10-25 pages, and they go into detail about the relationships between all those applying. Names of spouses, children, etc. And most importantly, the names of the parents of Samuel and Sarah Hartley: George W Hartley and Eliza Beasley. 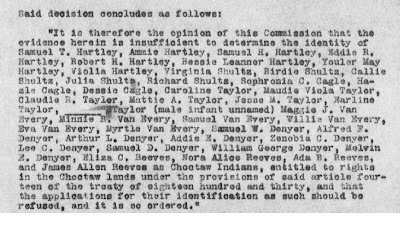 Samuel Hartley claimed to be 1/4 Choctaw, not 1/8. If accurate, this would double the percentage of my Choctaw ancestry from what I previously thought. Unfortunately, the claim was through their father, dashing any hopes that a test of my, or my mother's, mtDNA might contribute to the solution of this mystery. It would still be interesting to find out where my maternal ancestry originated, but it's much less likely to be Native American. Also, unfortunately, while the applications make reference to marriage certificates that were entered into evidence, none of these certificates are part of the files online. It does seem that my previous suspicions regarding the 1850 census are likely correct. The Eliza Hartley who is recorded as living with two sons Samuel and William is my third great grandmother, and Sarah was recorded in another household, likely as some sort of servant. JOHN, The Dawes Rolls are interesting documents to say the least. I find them difficult to use, however, but they do contain valuable clues to ones heritage. Thanks for this interesting look into Choctaw ancestry.